Another FANTASTIC story from the amazingly talented Amy Clipston! Leave it to Amy to show us the depth of emotion that tragedy will uncover in humanity. The future looks perfect for Veronica Fisher until an accident changes her life… forever. And then there’s Jason – who wishes he could find a way to comfort Veronica… if only it were so easy. This is a very different type story than any other I’ve read by Amy and I am intrigued by this new series. I can hardly wait to read more! 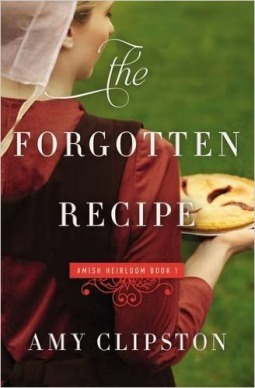 After losing her fiancé in a tragic accident, Veronica Fisher finds solace in the old recipes stored in her mother’s hope chest — and in a special visitor who comes to her bake stand to purchase her old-fashioned raspberry pies. Veronica Fisher knows how lucky she is to be marrying her best friend. Seth Lapp is kind, hardworking, and handsome — but most importantly, he loves Veronica. When an accident on the job steals Seth away from her, a heartbroken Veronica is certain she will never love — or be loved—again. Yet when she discovers a batch of forgotten recipes and opens a bake stand to sell her Mammi’s raspberry pies, Veronica picks up a regular customer who gives her heart pause. Jason Huyard was with Seth when he lost his life — a memory that haunts him still. So when he seeks out the grieving fiancée to convey his condolences, the last thing he expects — or wants — is to fall in love. Nonetheless, Jason soon finds himself visiting Veronica’s bake stand every week . . . and it’s for more than the raspberry pies.